In 3049, without warning, Kerensky's heirs set upon the Inner Sphere in a savage series of battles known collectively as the Invasion. On Tukayyid the Com Guards brought the seemingly unstoppable Clan war machine to a halt. The Invasion ended as suddenly as it had begun, and left in its place an uneasy peace. Both sides now had an opportunity to reassess their opponent's strengths and weaknesses and respond. By 3055, the first of a new breed of BattleMechs rolled off the assembly lines of the Inner Sphere, machines designed specifically to counter the technologically advanced weapons used by the Clans. Only time will tell if these new designs will be enough to turn the tide when battle is joined once again. 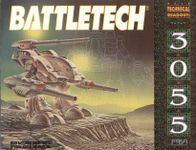 The Battletech Technical Readout: 3055 contains illustrations, descriptions, and compete statistics for new Inner Sphere BattleMechs and Clan OmniMechs, OmniFighters, and second-line BattleMechs.